So much of English common law is about precedent. When attorneys present arguments before judges, much of what they do involves citing previous cases and referring to previous judgments. The thing is, there must have been a time, in specific areas of litigation, when there was no precedent. There must have been a time when there was no ruling available for citing in a given matter. There was a time, then, before precedent. When the teachers of Belize hit the Government of Belize with industrial action this Monday, October 3, it appears to us that the whole process leading up to this clash has not been entirely procedural. By that we mean, the process of back-and-forth between the two parties may have been disjointed in spots. At least, this is how the Government of Belize has been presenting its side of the arguments to the parents and people of Belize. The Belize National Teachers Union (BNTU) does not seem to be fazed by the power and the presentations of the Right Honorable Prime Minister, Dean O. Barrow, and his Deputy Prime Minister/Minister of Education, Patrick Faber, and we find this somewhat extraordinary. All we can say is that we interpret the situation to mean that the BNTU is at the top of its game where experience and confidence are concerned, and that the teachers are willing to venture into uncharted waters. The brave teachers of Belize have decided to go where there is no real precedent, as far as we are aware. The teachers are fed up, and it has to be that, in their interactions with the parents of Belize, they have come to believe that this statement, by means of industrial action, has to be made, no matter the cost. The teachers have to be feeding off some source of energy amongst the people of Belize which is driving their BNTU motor. 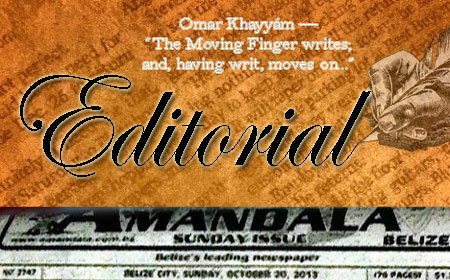 Offhand, we would like to consider three of the issues which have frustrated and infuriated the Belizean people. In one instance, the Chief Justice of Belize ordered the Commissioner of Police to investigate the Elvin Penner passport matter, and the Commissioner of Police, for all intents and purposes, refused. In his refusal, the Commissioner had to be following the advice and instructions of the Ministry of National Security, in the first instance; the Cabinet of Belize, in the second; and, ultimately and implicitly, the Prime Minister of Belize. In another instance, the Government of Belize was spending a lot of Petrocaribe loan money in violation of the Finance and Audit Act, an act to regulate the spending of public funds which the people of Belize, led by the teachers, had marched in the streets in 2005 to demand and secure. The United Democratic Party (UDP) administration went to the House of Representatives to change the law and make legal what had been illegal, and then proceeded to spend Petrocaribe money lavishly in a year-long campaign in 2015 to win a third consecutive term of office. Today, Belize is broke and the teachers have been asked to defer their pay adjustments. In the third example of the incidents which created the kind of Belizean socio-political atmosphere in which the teachers will strike on Monday, there was the incredible Llewellyn Lucas beheading. The man caught with the pastor’s head was a very, very, good friend of the Minister of National Security himself and also of the highest ranking of officers in the Police Department. The Government of Belize refused to consider a specific investigation outside of the department and ministry which had so obviously been compromised. You will note that we have not even mentioned the recent Auditor General’s report for 2011 to 2013, and the fact that just before that report was officially tabled, the United States government, we would say pointedly, revoked the visa of a former Chief Executive Officer in the Immigration Ministry who had been highly favored by this UDP administration. By February of 2005, enough evidence had been presented, in the opinion of the Belizean people, for that People’s United Party (PUP) government to have been replaced. It became clear, however, as a result of that period of Belizean history, that the supposed parliamentary democracy of Belize is actually and functionally a sequence of five-year monarchies, during which elected governments, no matter their felonies, cannot be removed by the people of Belize, at least not without violence and bloodshed. Now, history may be repeating itself, and this time with the UDP leaders who were originally elected in 2008 to save Belize from the 2005 PUP. The saviors have become villains. Straight up. It has to be that it is the frustration and outrage the Belizean people feel which the teachers have decided to express on Monday. When you challenged the authority of the monarchy in medieval times, you were usually tried for treason and executed. So, Belize’s third millennium version of monarchy is not classical. It is for sure that the elected UDP leaders of Belize are very angry at the BNTU, and they believe that their constitutional authority is being challenged by this industrial action of the teachers. As it is, our leaders have been trying to intimidate the teachers, but, for sure no teachers fear execution. They expect support from the Belizean people. What is now happening is not good for Belize. But it is probably necessary. The teachers feel there is no recourse, and they are, as a body, arguably the most informed and intelligent of Belizeans. Government of Belize leaders, for their part, feel that they have no choice but to defend their legally elected government by any means necessary. Note, we did not say any “legal” means necessary, because there are extreme elements in ruling parties which become activated when Belize reaches a certain level of instability. The teachers have always been scrupulously legal in their agitation and activities, but electoral politicians in Belize do not enjoy such immaculate reputations. Whereas the teachers are now fighting for principle, the ruling politicians and their supporters are fighting for money. This is real. Read between our lines.